The area around Llangollen has been occupied since very early times. Before 6000BC any human presence would have been in the form of small bands of hunters. After this time it is known that Neolithic farmers, originating from Europe, were present in North Wales, although it is only after 3000BC that we have any direct evidence of their presence in this area, in the form of many tumuli, cairns, stone circles and standing stones. A tumulus on top of Creigiau Eglwyseg was found to contain the remains of cremated human bodies, as well as ox and sheep bones when it was opened in the 1890s. A cairn near Aber Sychnant, 1½ miles to the north of World’s End, was also opened in 1890. It was found to contain some ashes, a horses tooth, some small bones and a flint arrowhead. Population of the area continued into the Bronze Age. The hill on which Dinas Bran stands was certainly occupied during this period. Four bronze axe heads have been found on Dinas Brân, one of which is displayed here. A fifth axe head was discovered in the 1930s on Fron Fawr. Two bronze spear heads were discovered in 1890 at, or close to, a quarry near to World’s End, although it is not known which one. The arrival of the Celts in Britain around 600BC heralded the start of the iron age. The Celts spread over the whole of Britain and brought with them the language from which present day Welsh is derived. 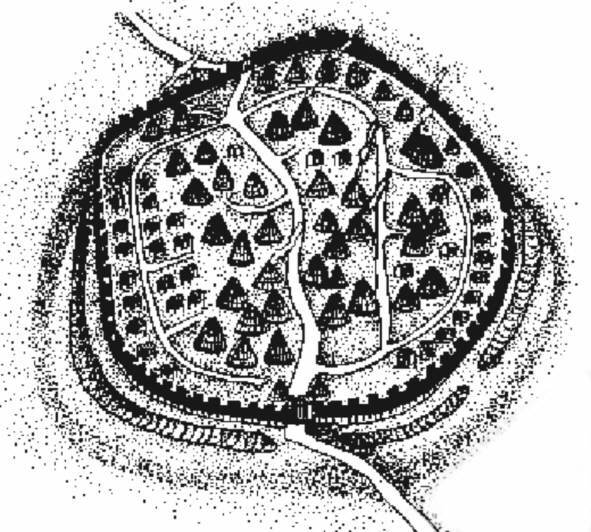 The Celtic tribe present in north east Wales was the Deciangli. Remains of Iron Age hill forts can be seen around Dinas Bran Castle and on the top of Moel y Gaer (an artists impression is shown here) in Llantysilio. In 43AD the Romans invaded Britain, and eventually gained control of Wales. Roman culture did not, however, put down deep roots, as it did in the south east and there is little evidence of their presence in the area. 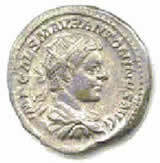 Exceptions include Roman artifacts found when excavating the cloister court at Valle Crucis Abbey, a coin bearing the head of Antoninus, found in the 17th century near to the Abbey and Roman pottery found in the Eglwyseg stream. With the withdrawl of the Romans from Britain at the end of the 4th century, there was mounting Saxon pressure from the east and the border area became the ground of many battles. By the mid 7th century the Saxon settlers had driven the Welsh out of the plains and into the foothills of the mountains. In the latter half of the seventh and early part of the eighth centuries, the Welsh made a number of efforts to reclaim their land, and it was in response to this that Aethelbald, king of Mercia, built Wat’s Dyke, running northward along the border from what is now Ruabon. After his reign was over it appears that the fortunes of Powys recovered. Eliseg, king of Powys in the mid eighth century, won a crucial victory against the English, saving the inheritance of Powys. Offa succeeded Aethelbald as king of Mercia and also made a number of attacks on the Welsh border. It was during his reign (757 to 796) that the remarkable structure known as Offa’s Dyke (a section of which is shown above) was probably constructed. Eliseg’s great grandson Cyngen, was the last in line of that dynasty of Powys. He erected a cross in memory of his great grandfather sometime between coming to power in 808 and his death in 854. Eliseg’s pillar (shown here), near to Valle Crucis Abbey, is what remains of the cross. It is one of the oldest inscribed monuments in Wales, and the valley afterwards became known as Pant y Groes (Valley of the Cross), after which Valle Crucis Abbey was named. The cross was knocked down and broken during the civil war of 1642 to 1646, but fortunately Edward Lhuyd recorded the original inscription, now totally worn away, when he passed the fallen pillar in 1696. In 1779 the remaining pillar was re-erected by Edward Lloyd of Trevor Hall and at that time, the tumulus on which it stands was opened, revealing the skeleton of a tall man with a gilded skull. The remains were re-interred but the men who uncovered the body said that the bones 'broke like gingerbread'. Lhuyd's transcription (part of which is shown on the left) records a vital piece of history - a contemporary inscription from the Dark Ages containing a genealogical record of the kings of Powys that can be compared with later documents. Cyngen, having no children, was succeeded by Rhodri Mawr (Rhodri the great), son of his sister Nest and Merfyn, Frych (Merfyn the freckled), and thus the second ruling house was founded. At the end of the 9th century Alfred came to power in England and some of the smaller Welsh rulers asked for his patronage. It would appear that this included Anarawd ap Rhodri, king of Gwynedd and Powys. In 1039 Gruffud ap Llewelyn killed Iago ab Idwal, great great grandson of Anarawd, and so became ruler of Gwynedd and Powys. He set his sights further afield, and by 1057 ruled all of Wales. He also managed to re-claim some lands beyond Offa’s Dyke, but revenge came in 1063 when Gruffud was killed by Harold in Snowdonia. Elected king of England 3 years later, Harold’s victory was short lived, and everything changed with the coming of the Normans in 1066. 1066 saw William of Normandy’s victory over Harold in the Battle of Hastings. Not many years later the Normans were at the Welsh border. William had no intentions of annexing Wales but wanted to secure a frontier. This he did by giving lands along the borders to some of his faithful supporters, creating the Marcher Lordships (see map). The main Lordships in this area, however, Bromfield and Yale (Iâl) and Chirkland, remained under Welsh rule until late in the 13th century. The latter half of the 14th century and the early 15th century saw some significant changes in the distribution of land with large landowners taking over from smaller farmers. The exact causes are not easy to identify, but the ravages of the Black death in Chirkland and Denbighshire undoubtably had a major effect. The beginning of the 15th century saw the start of the campaign by Owain Glyndwr to wrest back Wales from English control. With discontent rife amongst the peasantry, many of them flocked to support Glyndwr. 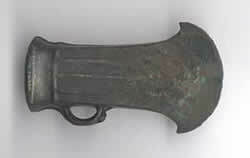 The area was constantly the scene of unrest as evidenced by this mediaeval dagger scabbard found near Valle Crucis Abbey.